Ray and Ginny’s refuge is one of the best-kept secrets in North County. The home sits on 0.75 acres, surrounded by 52 acres of common ground and wooded areas. 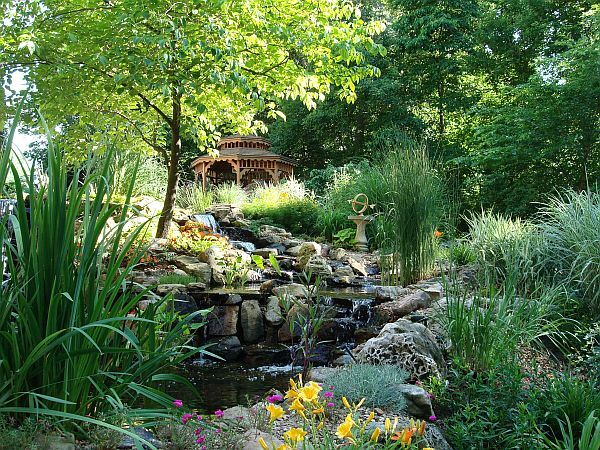 The water feature has an upper pond, two streams, multiple waterfalls and a larger lower pond. 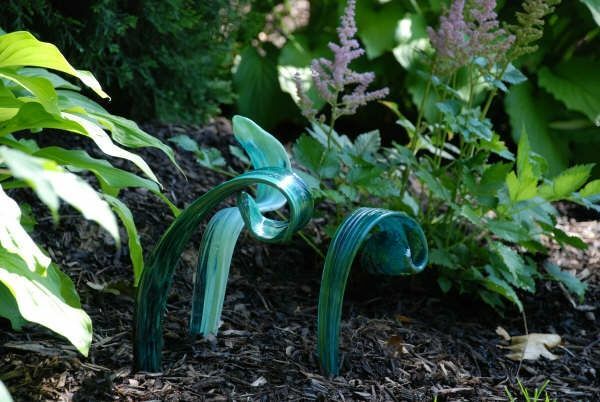 It is nestled in a wooded, lush natural landscape shaded by a lovely dogwood tree and numerous flowering plants. There are great views of the pond and gardens from the upper deck of the house, the patio and spa area as well as the garden swing and gazebo. – Size: The ponds are 12′ x 4′ and 13′ x 9′. – Special features: Two ponds, multiple waterfalls and a couple of streams with a 10,000 gallons-per-hour pump. Our first project over 30 years ago was to replace railroad ties when we initially purchased our home. We realized the natural slope was perfect for a flower garden, stairs, and a very small four-foot pond. 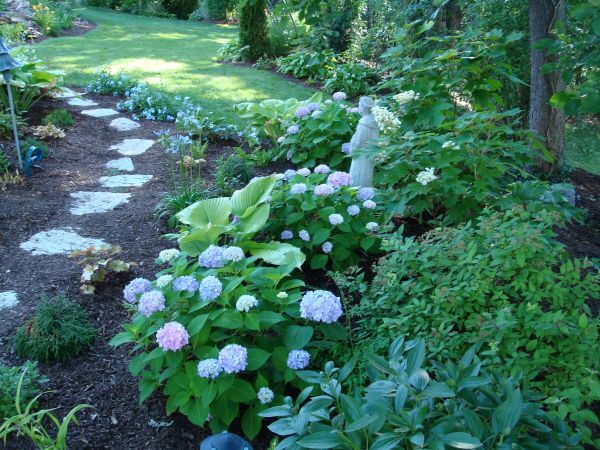 The area has been a display of varying flowers, shrubs and vines over the years; some experiments with perennials and annuals more successful than others. About four years ago, we decided to replace a tie wall along the driveway which somehow evolved into redesigning and expanding our water feature. Our beautiful dogwood tree became the focal point of the pond and a change of both perennials and annuals each year is exciting. 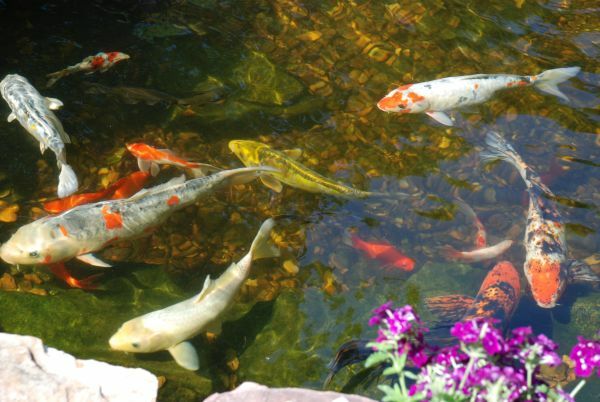 The koi have been a great addition and a learning process. 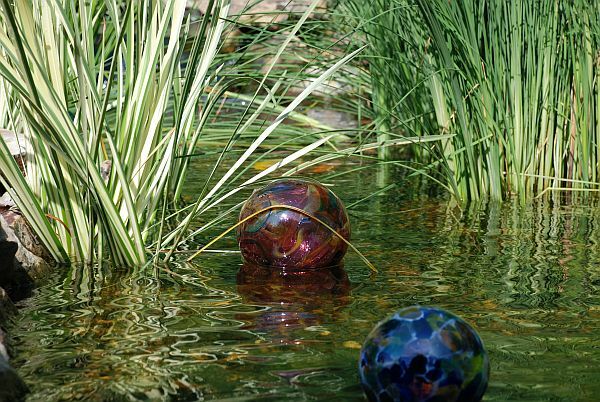 Last year we added hand-blown glass-inspired works of art from a Tampa, Fl artist, Susan Gott, in the pond and in the garden. Definitely a Chahuli-inspired feature. We love the water sounds and the pond seems to attract our local wildlife, birds, deer, and a dog or two. It has been the site of many parties, including a niece’s engagement party. Nature is meant to be enjoyed, preserved and enhanced. The changing seasonal views keep it interesting. The gift of nature is a treasure!